October is not a rabbit's favorite season for breeding! In the wild they don't breed at all through most of October and November. But in our barns and rabbitries, there are ways to naturally circumvent the rabbit's hardwired rest period. Deidre from Georgia (USA) contacted us in October. Her doe wasn't exactly in a romantic mood, and she wasn't sure whether or not a forced breeding had been successful. Especially since the doe was exceptionally cranky when reintroduced to a buck a couple days later. I shared my thoughts and ideas with Deidre here: October Rabbit Breeding: Did the Doe Get Pregnant? This pregnant rabbit is gathering hay for nest-making; how's THAT for a haystache?! You too can weigh in at that link if you also have some great answers for her. Just post a comment at the bottom of the page. Besides solving issues with breeding in October, Deidre asked me whether or not I thought her rabbit had successfully mated. The main signs of pregnancy can be found on our pregnant rabbit page. That page was written to help YOU answer that question, since YOU are there, eyes-on, with your own rabbits. Whether it is April or October, those signs will signal a rabbit pregnancy...or a false pregnancy. Even though sometimes you may not be sure whether or not the buck completed the mating, or the doe was not willing though the buck DID grunt and fall off, or whatever individual circumstance you run across while breeding your rabbits, sometimes the only thing left to do is to wait it out for 31 days, and prepare for a new litter, just in case. Is there an overpopulation of rabbits?? Don’t believe it - there isn’t one! And don’t let anyone tell you that 85%, or even 90% of bunnies are dumped off at animal shelters. That's just hogwash. The percentage is more like 2%. "Rabbits for Sale Near Me"
It's amazing how many people around the country are looking for rabbits for sale. We receive dozens of queries every month from people looking for "rabbits for sale near me." "Rabbits for sale near me" is a search term that brings visitors to Raising-Rabbits every single month. Check our Rabbits for Sale page for tips on finding wonderful rabbits in your own area. 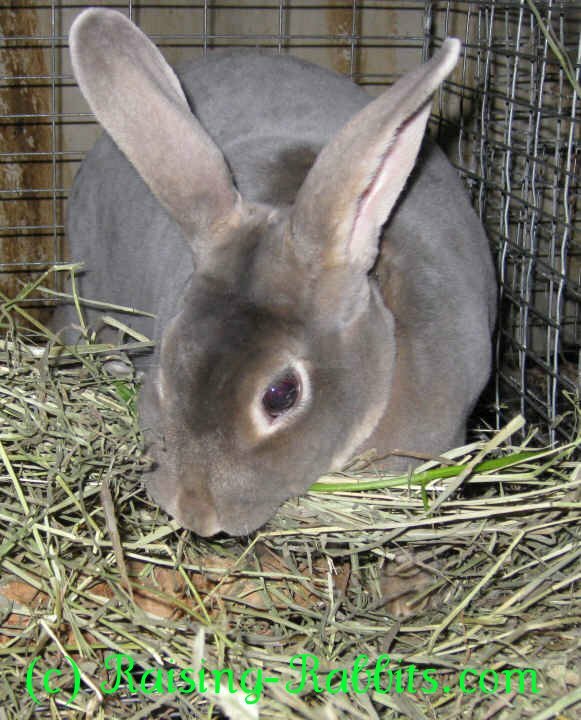 Additionally, we have listings of rabbits for sale categorized by state. You'll find links to these pages at the above link. Rabbits serve mankind. Humans have been using rabbits for wool and meat for over 5,000 years. Plus, breeders in the UK and Europe have been selectively breeding rabbits to specific purposes for over 200 years. The Angora Rabbit has been around nearly as long as meat rabbits. That is to say, the mutation causing growth of long wool instead of normal fur occurred probably thousands of years ago. 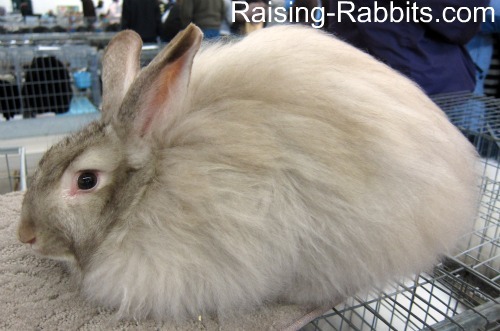 Careful breeding over the last couple centuries has resulted in a number of angora rabbit breeds of various body types, all of which have long, dense wool that can be harvested without harming the rabbit and spun into angora yarn or angora/wool blends. Learn more here about the history of the angora rabbit. 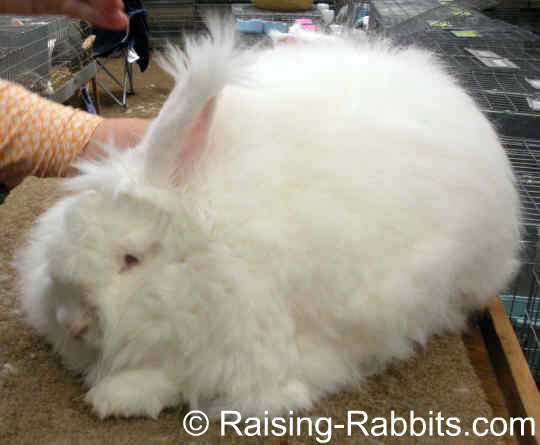 Plus, you’ll find links to info on each of the individual angora rabbit breeds. I'm excited to show you a brand new, very cool book! 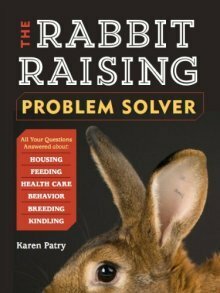 Rabbit Breeds: The Pocket Guide to 49 Essential Rabbit Breeds was recently published by Storey Publications. This delightful book is very well done, with photos and an overview of every breed of rabbit recognized by the American Rabbit Breeders Association. Check it out! Interested in more information on these or all rabbit breeds? 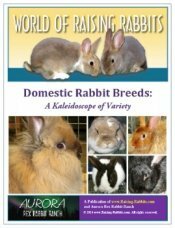 Our Domestic Rabbit Breeds e-book (info below) provides more photos, history and descriptions of the many rabbit breeds. Predator-safe all-wire rabbit cage measuring 36"x30"
By the time October rolls around, you may be looking for new cages, or additional cage space for newly purchased or newly raised youngsters. 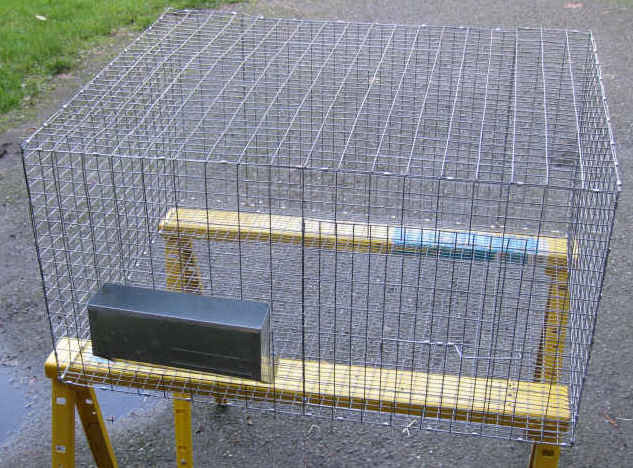 Here is a reminder that you'll find FREE all-wire rabbit cage plans here, in case you are inclined to build 'em yourself (as we are!). We have more freebies on the Raising-Rabbits website linked at our rabbit cage page, and we also offer our full illustrated indoor and outdoor cage, hutch frame, and rabbit run plans in the form of electronic e-books at very reasonable cost. Ideal DIY Rabbit Cages contains ALL our rabbit cage, hutch, and run plans for both livestock and show rabbits, AND for pet rabbits. Pet Rabbit Living Spaces contains some of our plans - mainly those that would be great for pet rabbits, and for indoor cages and corrals. DIY Livestock Rabbit Housing contains some of our plans - mainly those plans for larger cages and multiple cage set-ups that would be great for meat rabbits and show rabbits. Please note: If you purchase Ideal DIY Rabbit Cages, you will not need any of the other e-books. Unless of course you are purchasing a separate e-book for a friend or family member. If you prefer purchasing ready-made, top-quality cages, no problem. You'll find lots of sizes and options in our Raising-Rabbits Store. Your friends at Raising-Rabbits.com wish you a wonderful October 2016.